The Tijuana commercial and industrial real estate market is booming. Vacancy has dropped to 5% for the first time since the 1990’s. The Tijuana Industrial real estate market boomed in 2015 as Flex Medical (144,000 SF in Otay), Ink Throwers (200,000 SF in La Jolla Industrial Park), Jonathan Louis Furniture, (155,000 SF in El Aguila) Huyndai and others expanded into larger facilities. All classes of building are moving. As available space tightens, rates are rising as the market converts to the landlords favor for the first time in many years. PEC’s 174,000 SF building in El Aguila, before it could be marketed, rumour has it, was sold to a developer and leased. Good quality buildings are going fast. Class A rents are moving. Lease rates are over $0.42/SF with space located near the Otay border crossing asking close to $0.50 on a gross basis. Land prices are also rising with unimproved property close to the border going for over $80/SM and unimproved outlying areas getting more than $30 and $60/ Square Meter for improved land. Tijuana has over 900,000 SF under construction and over 350,000 SF in the pipeline. That is not enough to meet the over 3 million SF of absorption experienced in 2015. Developers are striving to meet the demand. Vesta finished a 304,000 SF spec building, the largest ever built in Tijuana without a tenant in hand, a big gamble, but it paid off as they leased part to a Samsung Supplier before it was finished. Vesta is also planning a new park in East Alamar. FINSA and newcomer ROCA combined have over 500,000 SF planned for the Alamar market for early 2016. IAMSA (new spec 124,000 SF under construction), The Fimbres family (new spec 98,000 SF finished) and El Florido (new spec 186,000 SF planned) continue their growth in the El Florido sub-market. TAE industrial park is also planning new buildings on the other side of Blvd. 2000. The Fimbres family is also planning more development near the El Aguila central market, highly improving the construction quality of their offerings with their association with Miguel Enciso at INHOGA. IGS is also building a new 119,000 SF building in El Aguila. Rosarito and Tecate real estate markets are also seeing major growth. Rosarito is experiencing a boom in demand with Hyundai purchasing 10 Hectares for a new container building. Their suppliers are being asked to also move west to this picturesque coastal community. 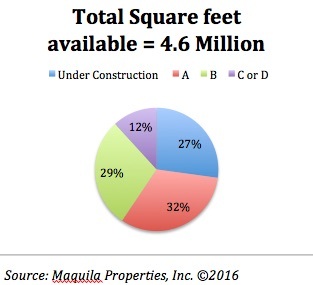 With very little available space, we expect to see construction of several build-to-suit buildings to accommodate demand. Rental prices have jumped from the $0.25/SF range just 2 years ago to $0.34 NNN today. Tecate has a new rail terminal under construction and we hope this time, it is not just a pump and dump stock scheme. Major work is under way for an in-bond multimodal facility. Problems still include the damaged bridges and trestles on the US side and the fact that double stacking is not available because the rail line is shared with the San Diego trolley. There are currently 35 Buildings available in Tijuana over 50,000 SF with an average triple net asking rate of $0.40/SF. Actual rates depend on the quality of the building, the tenant, the terms and of course, the location.